One thing that especially impressed us with the Panasonic NN-SN752S was that, while it has a generous 1.6 cubic foot capacity, it is still compact enough not to take up too much counter space. And the cooking performance of this model will more than satisfy users, as will the sensor cooking that takes out the guesswork in heating or defrosting meals by sensing the amount of steam. We also liked the perfect melding of form and function, as this model is sleek and attractive and is also easy to use. A downside with stainless steel, however, is that it collects fingerprints easily, especially since this model has no handle, just a button. Another issue we saw was that the green digital display is quite dim and can be hard to read from a distance. 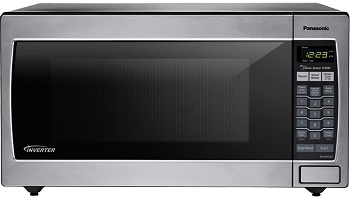 Still, this microwave’s array of features and superior performance make it a purchase worthy of consideration.